The translation and interpretation industry is a typical example of how technology has been moving us towards tomorrow’s world. Monterey Language Services recently posed a question about automation in the workplace to people who are interested in working with us in the office. We found that the answers are interesting and representative, and therefore we did a further analysis; here is the report we would like to share. A total of 63 people responded to our question, and these 63 responses amount to a total of 4,708 words. Of these 4,708 words, 192 relate to machine/technology/automation/social media/internet, while only 133 relate to humans/people/individuals. Two thirds (42) were in favor of technology. No one was against technology or had a completely negative outlook on the effects of technological automation. Some concerns or reservations with technology and automation had to do with humans losing jobs to machines and losing face-to-face interaction. 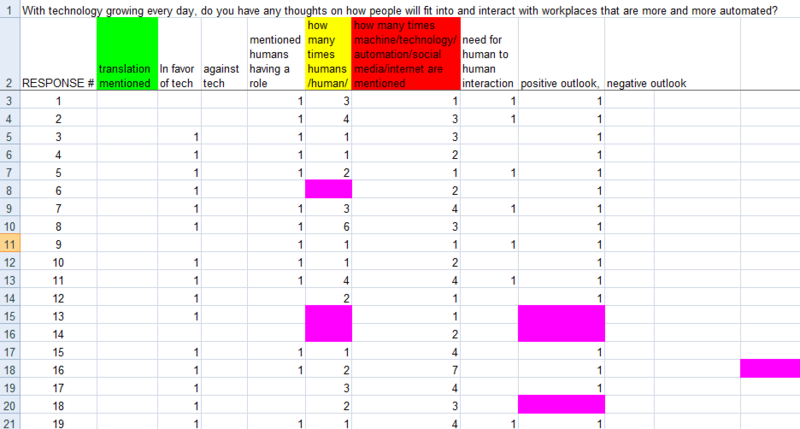 However, 48 respondents (76%) mentioned humans having a role in the automated workplace. Of these 48 respondents, 7 elaborated that automation may replace jobs involving repetitive tasks, but will free up humans to do more important work: customer follow-ups, creative and critical thinking, and research and innovation. On the other hand, nine respondents did not mention humans/people/individuals in their responses, whereas all respondents mentioned technology or automation in one form or another. Moreover, only 19 respondents (30%) mentioned a need for human-to-human interaction. 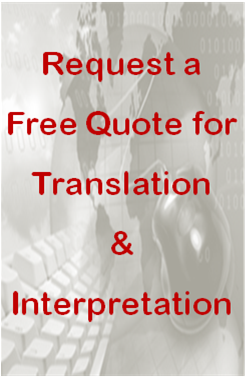 Five respondents expressed their concerns with automating translation and interpretation services. Four of these five respondents believed that humans should still have a role in providing these services. For example, people will still need to correct the mistakes made by machine translation. Specialized translations and reviews of culturally-related work will require human intervention due to the complexity of human language, thought, and emotion. The overall sentiment was that translators and interpreters will not be replaced by technology, but by translators and interpreters who utilize technology to the best of its capabilities. One of the five respondents expressed concern that pay rates for human translators may decrease, since speed and ease of review may increase significantly through the use of technology. Overall, more than three fourths of respondents mentioned humans having a role in automated workplaces, including in the translation and interpretation industry. In general, respondents had a positive outlook on the effects of technological automation. These statistics were determined through word searches for human*/people/person/individual, and for machine/technolog*/automat*/social media/internet and related words. These statistics were determined by categorizing whether a response was generally in favor of technology, and whether it had a positive or negative outlook on the effects of technological automation. All other statistics were derived from statements made in the responses.